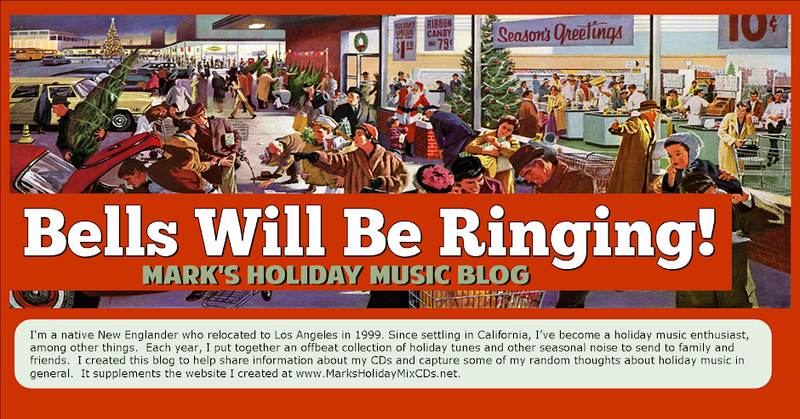 Here's some dirt on two more of the songs that appear on my latest holiday mix, C'est Noel! 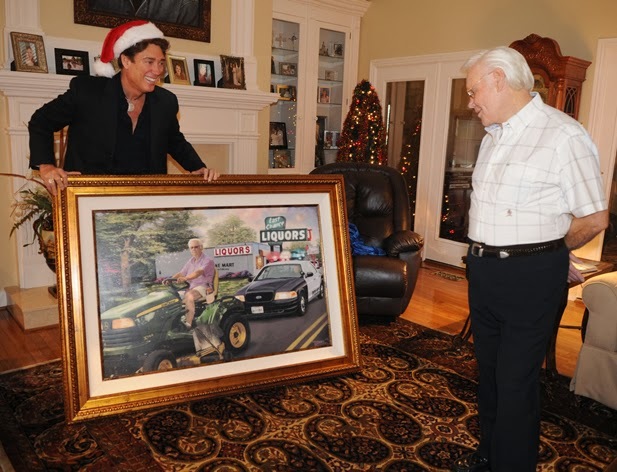 George Jones (right) reviews a painting his wife commissioned of his famous DWI arrest while driving a riding lawnmower to the liquor store. On the 50th anniversary of President Kennedy's assassination last month, some 112 artists gathered with thousands of fans at Nashville's Bridgestone Arena for what co-host Charlie Chase called "the largest tribute event in music history" in honor of the late country music legend George Jones. Jones' facial features led him to be nicknamed "The Possum," and his long battle with alcoholism caused him to miss more than a few gigs over the years, so last month's show was aptly christened "Playin' Possum: The Final No Show," and it seems to have been a night to remember. As former Arkansas Governor Mike Huckabee remarked from the stage, "You're all going to remember where you were on November 22, 1963." That's a different issue, of course, but everybody knew what he meant. Jones, who died on April 26 at the age of 81, had his first #1 country hit in 1959 with the song "White Lightnin'," and despite a good number of ups and downs, he went on to top the country chart with 13 additional songs and remained a vital presence in country music throughout his life. 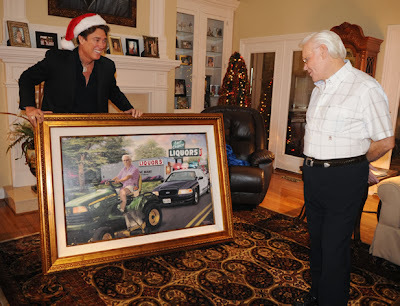 "New Baby for Christmas" is one of about a dozen Christmas songs Jones recorded over the years, although I don't believe he released a holiday album until this year's Classic Christmas Album, which consists of songs previously recorded with his ex-wife, Tammy Wynette. "New Baby for Christmas" appears in its original form on the Classic Christmas Album, and it's a great little tune from an extremely talented man who epitomized the hard-living, hard-working country musician. Hear George Jones and Tammy Wynette Sing "Mr. and Mrs. Santa Claus"
Hear George Jones Sing "Lonely Christmas Call"
More than a few of us were taken aback by the sudden death of actor James Gandolfini this past June, partly because he was only 51 years old, but also because he was such a vital and vigorous man who seemed to be really hitting his stride. Best known for playing mob boss Tony Soprano in HBO's smash hit series The Sopranos, a role that won him three Best Actor Emmys, Gandolfini also produced several documentaries for the network about issues of concern to U.S. veterans of the War in Iraq. I'd hoped to include a clip in this year's mix from one of the Soprano family's holiday extravaganzas, but despite a painstaking review of Tony's many holiday appearances, I was unable to find a suitable audio clip lasting longer than five seconds that wasn't interrupted by profanity. (If you're over 18 and don't mind adult language, be sure to check out this classic scene in which Tony Soprano realizes in a holiday flashback that a former associate was wearing a wire for the feds while playing Santa Claus for a neighborhood Christmas party.) Lucky for me, Gandolfini also appeared alongside Ben Affleck in the 2004 movie Surviving Christmas, which is where I found the clip for Track 29. 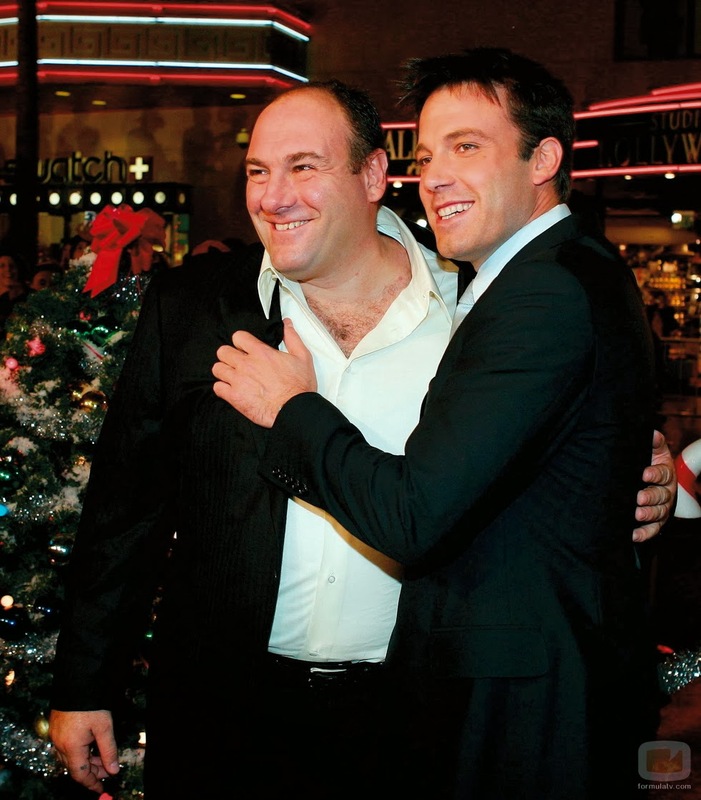 In the movie, Affleck plays a wealthy but lonely executive who pays Gandolfini's character $250,000 to spend the holidays with him and his family. The movie received bad reviews and did poorly at the box office, but I thought the clip I used was rather endearing, and a whole lot more acceptable than the kinds of scenes that made The Sopranos so successful. By all accounts, Gandolfini was about as different from Tony Soprano's bad qualities as one could get. He's another man gone too soon. Labels: C'est Noel!, CD Notes, Country Christmas, George Jones, James Gandolfini, R.I.P.